We’ve written in the past about Native Ad Networks (also known as “Content Discovery Networks“) and how large advertisers are allocating portions of their ad spend to networks like Taboola and Outbrain. 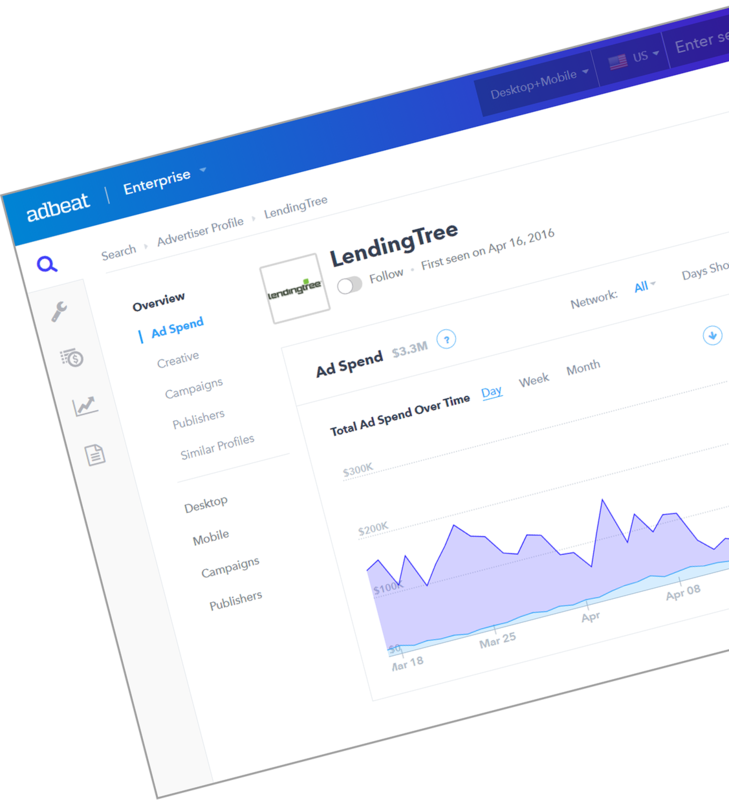 We’ve also written about how they’ve been switching over to pre sell pages from traditional sales letter, VSL and opt-in pages. One of the benefits to using a landing page in this style is that you don’t have to be an expert copywriter to put together an effective page. That’s why we want to go a little more in-depth into the specific copy being shown on these landing pages. In today’s post you’ll find breakdowns for 3 different landing pages from different advertisers. The Headline – Get their attention. The Lead – Get them interested enough to read the body copy. The Body – Make them desire what you’re offering. The Close – Close it out and get them to take the next step. DermStore is an eCommerce store that sells women’s makeup and skin care products. 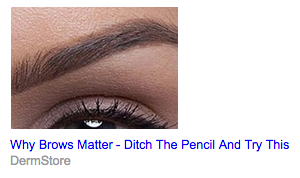 Their top ad is a simple picture of a nice looking eyebrow with a tiny bit of text. The “Ditch The Pencil And Try This” part of the copy is powerful because many women use a pencil to style their eyebrows. This makes them curious to find out why they should ditch their pencil and what they should use instead. The landing page looks like a traditional blog post with beauty tips. The goal of the page is to get the user to click through to DermStore’s shop and purchase Smartbrow, “a tinted, semi-permanent brow gel with hair-like fibers”. The headline is written as if it was the headline of a normal blog post. The “tips” in the headline make it appear less like a pre sell page. The baby boomer generation has created a large demand for anti aging products and supplements. Any articles with tips on how to slow down the aging process will be quite compelling. When we think about aging, the first thing that comes to mind is wrinkles. But there’s another issue that we often ignore, one that adds years to our age even way before our first wrinkle appears: thinning eyebrows. 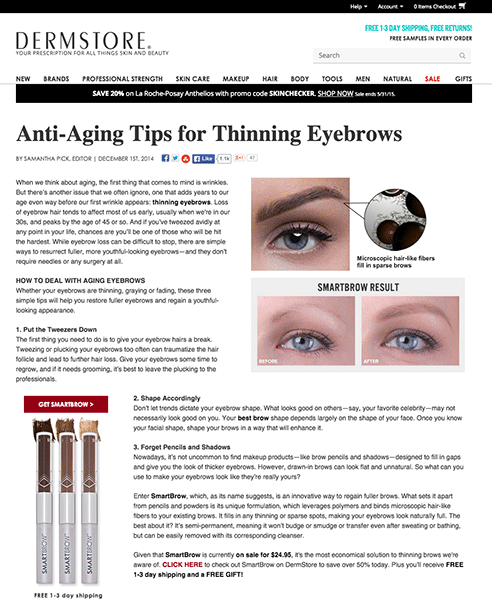 This lead addresses a different issue that most people aren’t necessarily thinking about when it comes to aging: eyebrows. Pointing out that your eyebrows “age you” faster than wrinkles is huge. This one statement makes you want to read the rest of the article and learn what to do about it. “3. Forget Pencils and Shadows”. These tips follow through on the promise made in the headline. Yet, they’re written in a way that you can’t solve your eyebrow issues just by reading these tips alone. 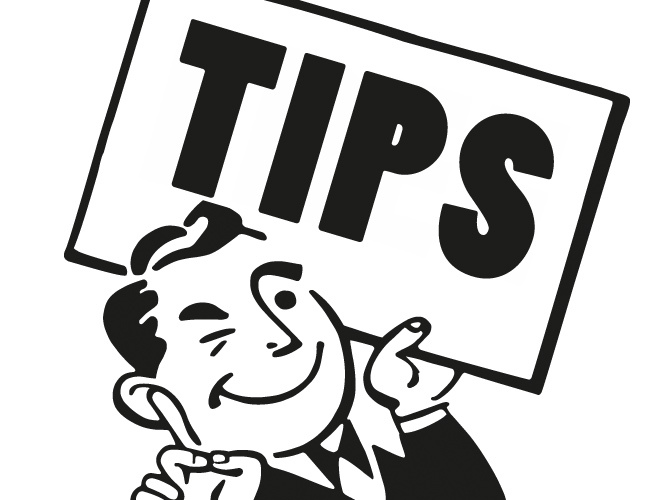 These tips don’t give specific how-to information. It tells you what you should NOT be doing, yet they don’t say exactly what you should do. The body copy’s goal is to convince the prospect that tweezers, shaping and pencils are not important. The REAL solution is the product. The “that we’re aware of” part tones down the close a bit. News stories and blog articles are not written in a hard selling style. Blog posts like these are usually written as a recommendation, not the “BUY THIS NOW!” style. QuiBids.com is one of the largest penny auction websites operating in the United States. What is a “penny auction”? Participants pay a non-refundable fee to place each bid. You can usually only bid a penny at a time. The fee to place the penny bid is higher than a penny (usually around $1.00). The auction ends quickly and the last person to bid wins the product and pays the final price. The price might be lower than the retail price of the product — it might not be. QuiBids makes money by collecting fees for the bids and receiving the payment for the winning product. Both will usually total more than the price QuiBids paid for the product. 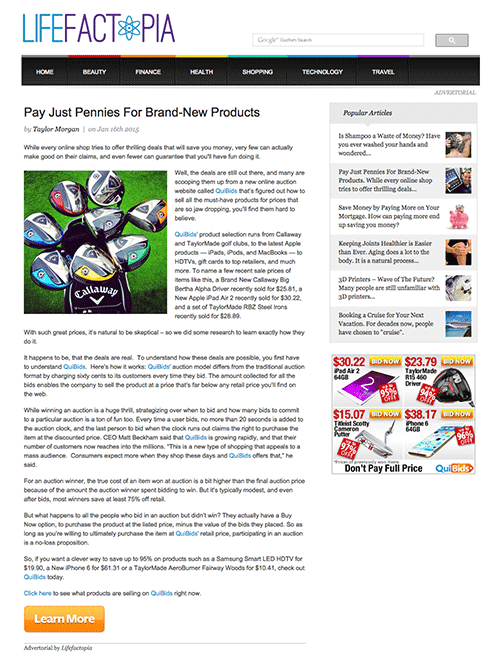 Although QuiBids auctions off a wide variety of items, they use golf products in their ads. Any online store that sells various products should test different items in their ads + landing pages to determine which product gets the highest response. QuiBids probably tests multiple items and then runs ads with the products that resonate best with their prospects. This native ad was featured on a website called Lifefactopia. This site is like an “advertorial portal”. It’s designed to look like an organic blog, but it contains mostly advertorials. This builds trust since the information appears to be coming from a third party. This is a simple “you’re going to save a lot of money” headline. Yet, it’s a bit different. “Pay Just Pennies” works well because it’s specific. It creates imagery in your mind. Specificity is very powerful. That’s why you see numbers and phrases in ads. A headline like, “Save Big on Brand-New Products” might not be as effective. “Save big” isn’t specific. “Pay Just Pennies” is. You can almost imagine yourself paying for an iPad with a handful of pennies. While every online shop tries to offer thrilling deals that will save you money, very few can actually make good on their claims, and even fewer can guarantee that you’ll have fun doing it. This first line builds curiosity and makes the prospect agree with you. Everyone knows a lot of “deals” online are actually not deals at all. It makes the prospect assume they’re about to read about a site that will actually give them great bargains. Well, the deals are still out there, and many are scooping them up from a new online auction website called QuiBids that’s figured out how to sell all the must-have products for prices that are so jaw dropping, you’ll find them hard to believe. This copy is pretty hypey. The use of words like “jaw dropping” might start to amp up the doubts in the prospect’s mind. …admits what they previously mentioned is difficult to believe. This helps the prospect place more faith in what they’re saying since they address one glaring point. This, combined with the third-party news story, makes it more believable. Then they go on to explain how it works. This is basically giving the prospect directions on how to use the service. “You’ll typically pay more than what you bid, but not by much”. They don’t tell you that you’ll get the best deal you’ve ever seen. They amp up the believability factor by mentioning that the deal won’t be as good as it might appear, but you’ll still save 75% off retail. Most people would be okay with 75% off. So, if you want a clever way to save up to 95% on products such as a Samsung Smart LED HDTV for $19.90, a New iPhone 6 for $61.31 or a TaylorMade AeroBurner Fairway Woods for $10.41, check out QuiBids today. Click here to see what products are selling on QuiBids right now. No one would complain about getting an LCD TV for just $20 bucks. It’s a bold claim, and all the copy leading up to this has to be very convincing. NewRetirement.com gives information on how to manage and stretch your finances after retirement. This offer focuses on their reverse mortgage lead generation service. The ads are very simple, “AARP” style ads with images of older women who have aged well. The most seen ad on the right has a simple “The Downsides of a Reverse Mortgage” headline. The other less seen ad asks a question in the headline. Reverse mortgages tend to be quite popular for cash-strapped seniors. This “article” outlines the pros ad cons. The landing page is longer than the other pages in this blog post. It’s almost like a long-form sales letter in some ways. They’re probably using a longer landing page because the prospect needs more information in order to make an informed decision. Getting a reverse mortgage is a huge financial decision that has many potential repercussions. It’s not like buying a set of golf clubs or grooming your eyebrows. Straight forward “Pros and Cons” style blog article headline. Even though they do lead generation for reverse mortgages and make money when people do so, they tell you why you shouldn’t get a mortgage. This is a great strategy no matter what product you’re selling. Your copy instantly becomes more credible when you admit its shortcomings. People are more likely to trust someone when they admit their faults as opposed to when they focus on the good. 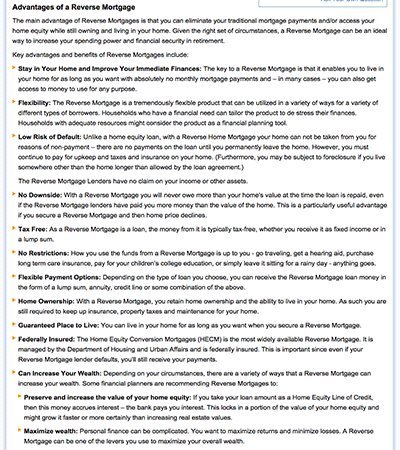 The beginning paragraphs describe the pitfalls most people don’t consider when it comes to getting a reverse mortgage. This provides credibility to the service because they don’t say this is the best, safest mortgage out there. In fact, they say the opposite. For many people, a Reverse Home Mortgage is a good way to increase their financial profile in retirement – positively affecting their quality of life. And while there are numerous benefits to the product, there are also some drawbacks. Reverse Mortgages are providing improved financial security, a better lifestyle and real financial relief to thousands of older Americans. However, there are some disadvantages. Then they go on to list 3 disadvantages of getting a reverse mortgage. Again, this is to build up credibility by admitting that they do have their shortcomings. Many experts shunned the product early on thinking that it was a bad deal for seniors – but as they have learned about the details of Reverse Mortgages, experts are now embracing it as a valuable financial planning tool. This is almost like a complete turnaround from what they originally said. 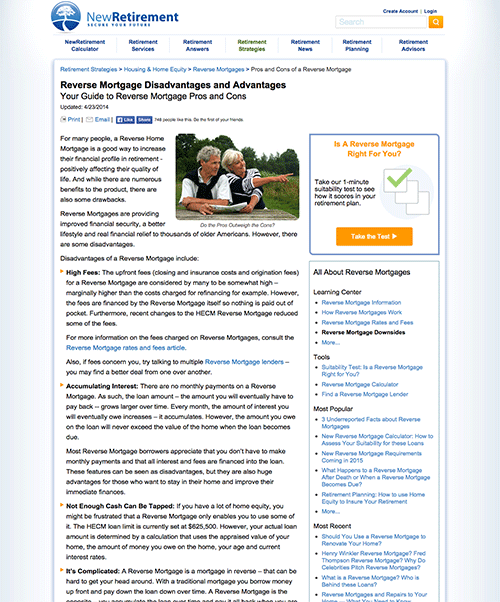 They admitted the disadvantages, but now the “experts” have changed their opinion on the reverse mortgage. The prospect is presented with a laundry list of reasons why reverse mortgages are beneficial for seniors. This is almost like the “bullets” of a long-form sales letter. They write one main benefit and bold it. Then they follow-up with a more detailed explanation of each bullet. The bolding of the main benefit is important because people don’t read — they scan. Using bullets is a great way to make sure they see the main benefits. 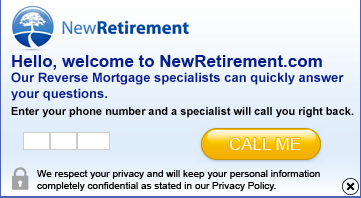 They include another section to eliminate people who are not right for a reverse mortgages. This adds further credibility to the article. It’s great to add specific numbers, studies and proof to back up your claims. Yet, they didn’t really do this here. They could amp up the believability even more if they wrote something like, “A study in The Journal Of Senior Finance shows that 90% of households who have secured a Reverse Mortgage are extremely happy they got the loan”. NewRetirement has placed a floating box where prospects can enter their phone number and a NewRetirement representative will call them. Older people often prefer to talk things out over the phone. They’re making it easier for the people in their target demographic to “opt-in”. Native Ad landing pages are an easy way to test out a new style of landing page that is working very well. The insights in this post should get you well on your way.